EB06263 (2µg/ml) staining of nuclear HEK293 (A) and (1ug/ml) Human Breast cancer (B) lysate (35µg protein in RIPA buffer). Detected by chemiluminescence. EB06263 (1µg/ml) staining of Mouse (A) and (2ug/ml) Pig (B) Testes lysate (35µg protein in RIPA buffer). Detected by chemiluminescence. EB06263 (10µg/ml) staining of paraffin embedded Human Testis. Microwaved antigen retrieval with Tris/EDTA buffer pH9, HRP-staining. EB06263 Immunofluorescence analysis of paraformaldehyde fixed U2OS cells, permeabilized with 0.15% Triton. Primary incubation 1hr (10ug/ml) followed by Alexa Fluor 488 secondary antibody (2ug/ml), showing nuclear staining. The nuclear stain is DAPI (blue). Negative control: Unimmunized goat IgG (10ug/ml) followed by Alexa Fluor 488 secondary antibody (2ug/ml). EB06263 Flow cytometric analysis of paraformaldehyde fixed HEK293 cells (blue line), permeabilized with 0.5% Triton. Primary incubation 1hr (10ug/ml) followed by Alexa Fluor 488 secondary antibody (1ug/ml). IgG control: Unimmunized goat IgG (black line) followed by Alexa Fluor 488 secondary antibody. Peptide with sequence ELETRMDQVTCAA, from the C Terminus of the protein sequence according to NP_543026.2. Western blot: Approx 55kDa band observed in Human Breast cancer and in Mouse and Pig Testis lysates, and approx. 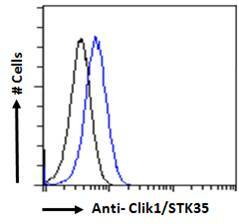 58kDa in nuclear lysates of cell line HEK293 (calculated MW of 58.1kDa according to Human NP_543026.2, 59.5kDa according to Mouse NP_899085.3 and 59.2kDa according to XP_005672850.1 Pig XP_005672850.1). Recommended concentration: 1-3µg/ml. Primary incubation 1 hour at room temperature. This product has been successfully used in WB on Human: Goyal P et al, PLoS One. 2009 Sep 16;4(9):e6981. PMID: 19756140. 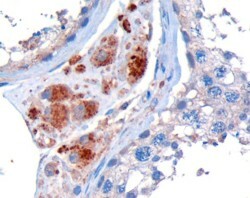 IHC: In paraffin embedded Human Testis shows granular cytoplasmic staining of Leydig cells. Recommended concentration: 10µg/ml. Immunofluorescence: Strong expression of the protein seen in the nuclei of U2OS cells. Recommended concentration: 10µg/ml. 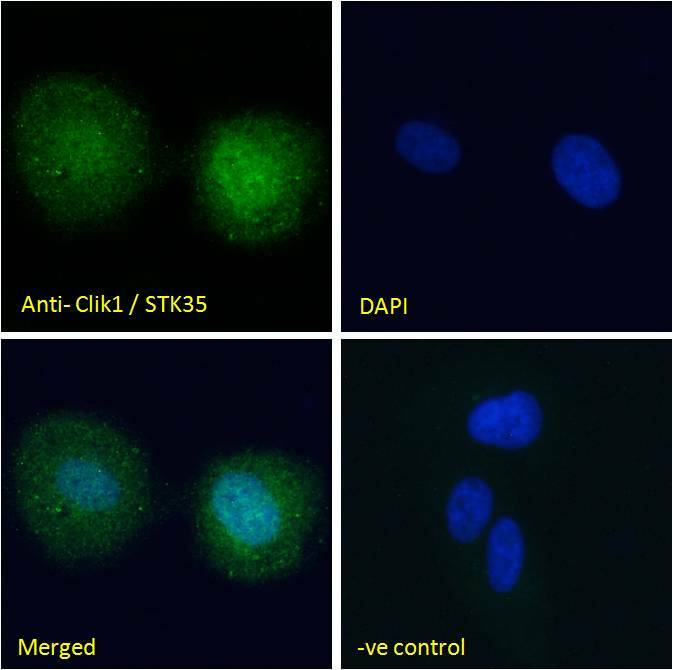 Goyal P, Behring A, Kumar A, Siess W.
Identifying and characterizing a novel protein kinase STK35L1 and deciphering its orthologs and close-homologs in vertebrates. PLoS One. 2009 Sep 16;4(9):e6981.